Beth Castantini surrounded by three Pentucket players. Game MVP Coley Viselli puts up layup in traffic. 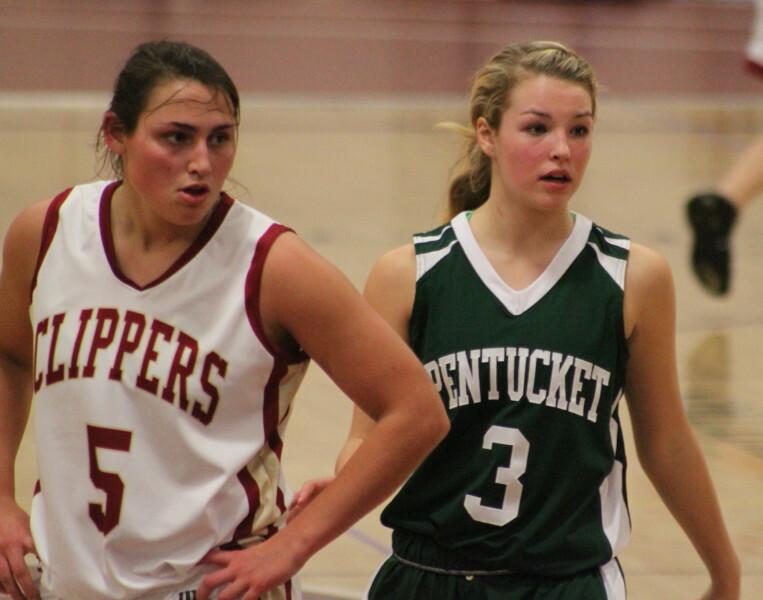 (Newburyport) Two of the best girls’ teams in the area opened the 2011-12 basketball season against each other in the Provident Bank Tip Off Classic on Monday night. 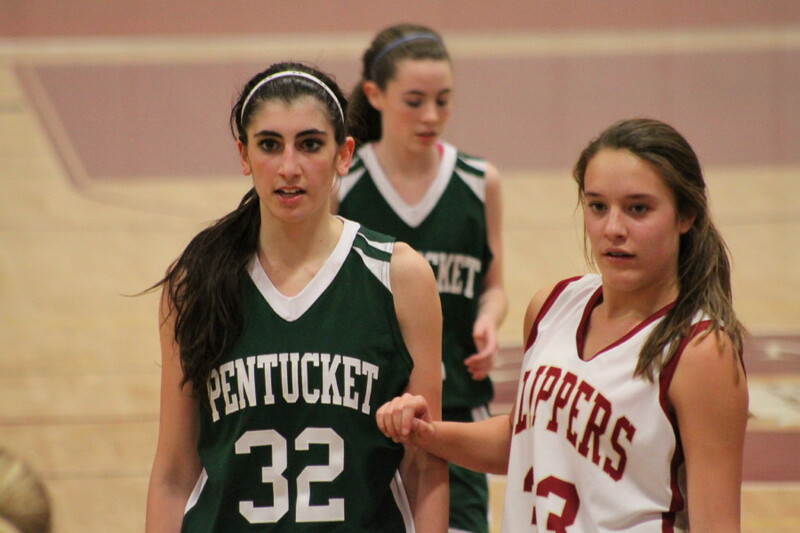 A strong final quarter gave the visiting Pentucket Sachems a 44-37 win over the Newburyport Clippers. 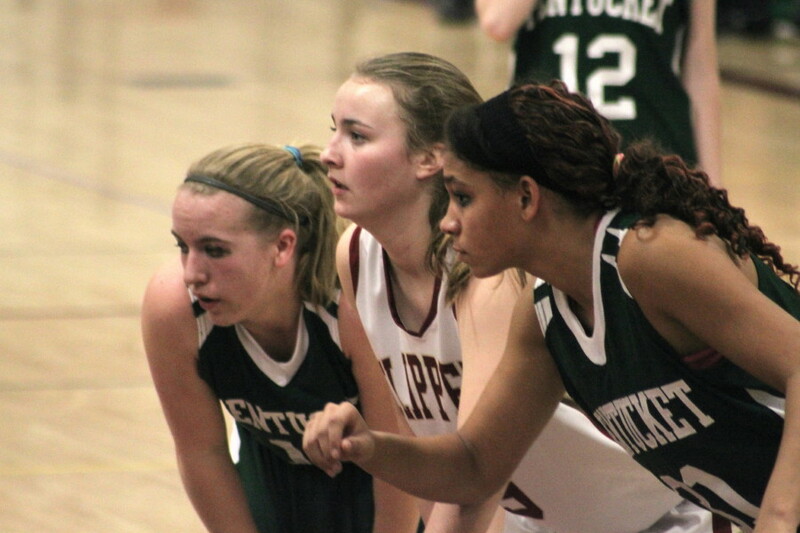 Pentucket (20-5 in 2010-11) predictably came at the Clippers in defensive waves all over the court and let the long ones fly with abandon on offense. Sometimes it worked……….sometimes it didn’t. 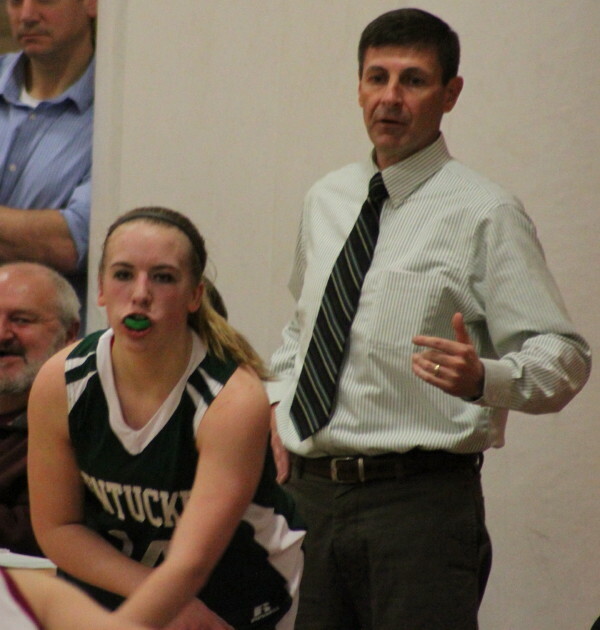 After a fast start (3-for-5) Pentucket’s long ball accuracy vanished, as 2-for-16 the rest of the way would suggest. But three minutes into the final quarter junior Alex Moore hit one and was fouled by Meri Adsit. 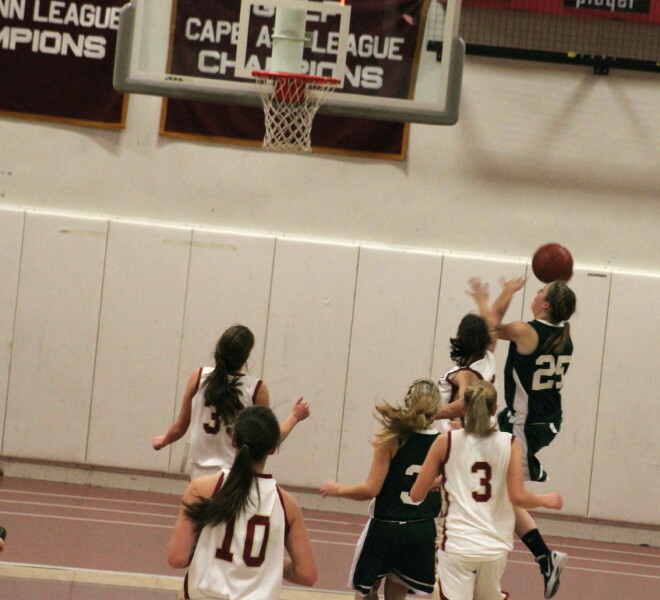 Alex completed the 4-point play to give the Sachems a 39-33 advantage. 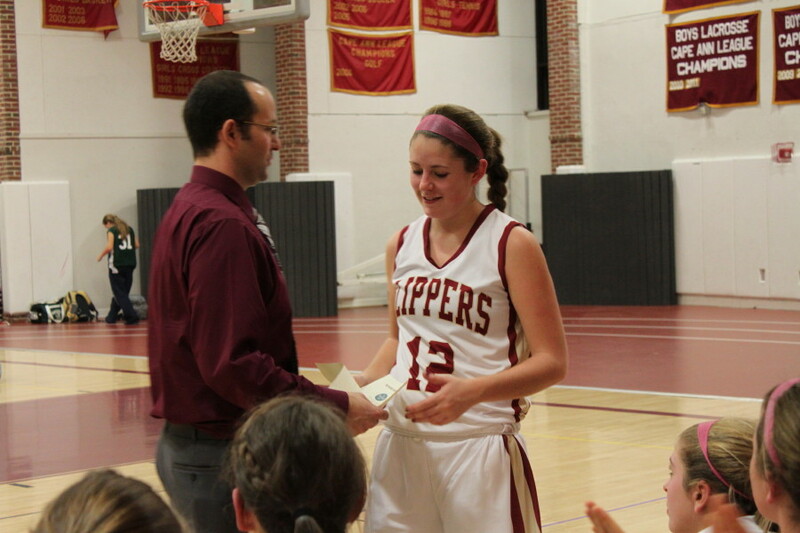 Newburyport rallied nearly all the way back after trailing, 18-4, early in the second quarter. Pitiful Pentucket shooting in the 3rd quarter (1-for-13) opened the door for the Clippers (5-for-9 shooting) to erase a 27-14 halftime deficit. A Lea Tomasz three with two seconds left put this one in the “very interesting” category (31-29) with a quarter left. Leigh McNamara (25) sails in for a first half layup. As I said, Alex Moore hit a huge three in the final quarter but it was the Pentucket pressure over the final 5+ minutes that really did in the Clippers. The pressure seemed to work best in the half-court as there were no turn-2’s (steal and get a layup) in the decisive final minutes. Newburyport got within one (32-31) on a Lea Tomasz converted rebound and two (35-33) on a Beth Castantini jump shot with 5:40 left. Plenty of time left and certainly close enough score-wise for the home team to pull the upset. 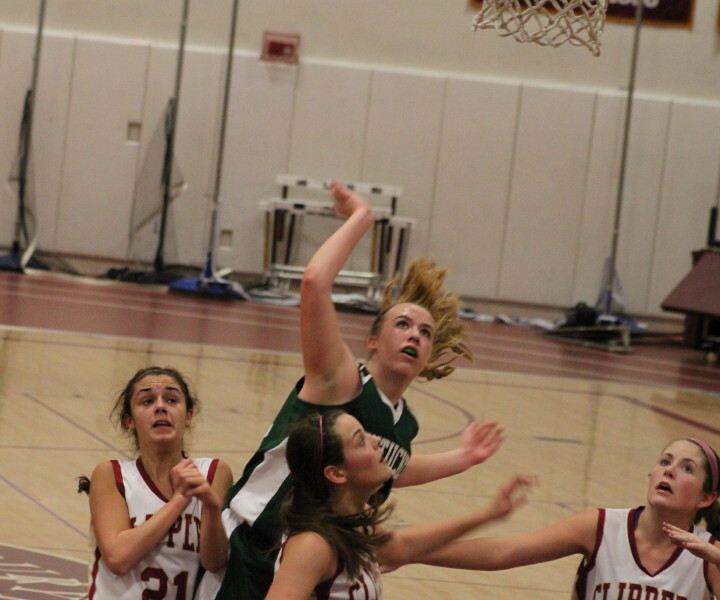 However, the Pentucket defense gave up only one point (Beth Castantini free throw) over the next 5 ½ minutes! 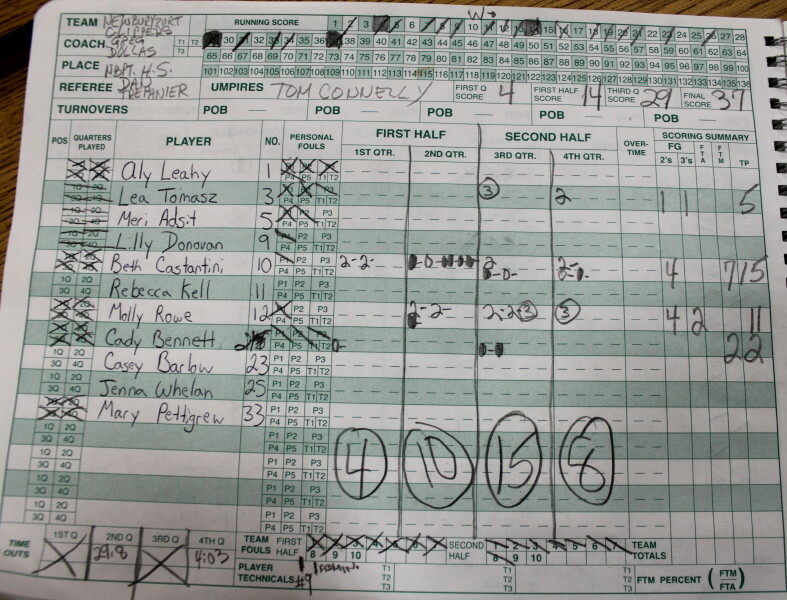 Molly Rowe hit a three with a few seconds left but by then, as they say in farm country, the cows had left the barn. The shocking numbers for the Clippers during those game-deciding 5 ½ minutes were: one point in eleven possessions, eight turnovers, three shots in one possession and only one shot in the other ten. Those are dream/nightmare numbers depending on which bench you were sitting on. Speaking of nightmares, Clipper coach Gregg Dollas will probably remember this game for a while as one where he learned something about the numbers on his players’ uniforms. 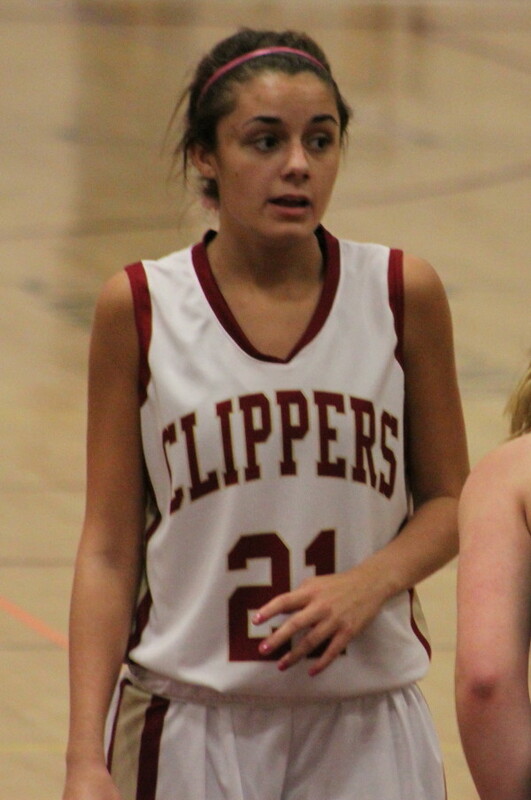 As the game was about to start the Clippers were assessed a technical foul because Cady Bennett was in the scorebook as #14 but was wearing #21. Coley Viselli sank both technical foul shots. 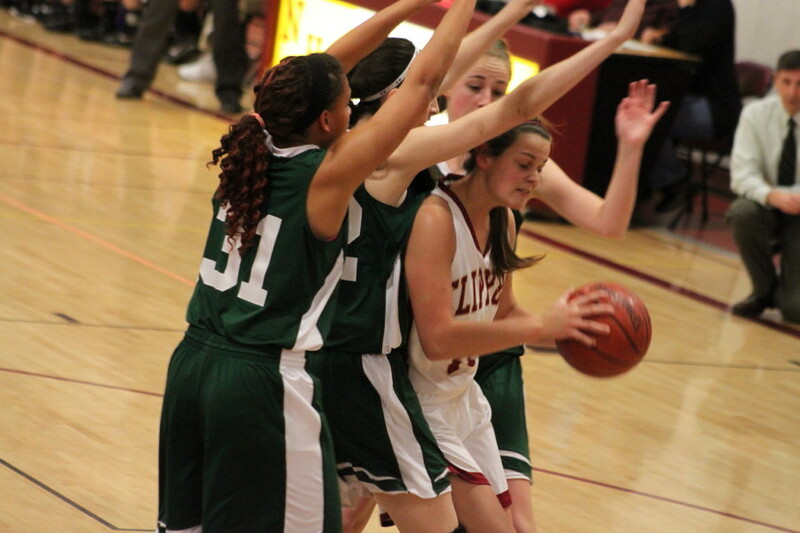 Later in the first quarter, Lilly Donovan was put in the game wearing #9. Players can’t wear single digit numbers above 5.…….probably because officials can’t finger signal 6-9 without possibly confusing the scorekeepers. Coley made one of the technical foul shots. That’s three points, and in a close game like this one, they were a tough giveaway. Coley Viselli was chosen MVP of the game. Good thing they didn’t ask me. 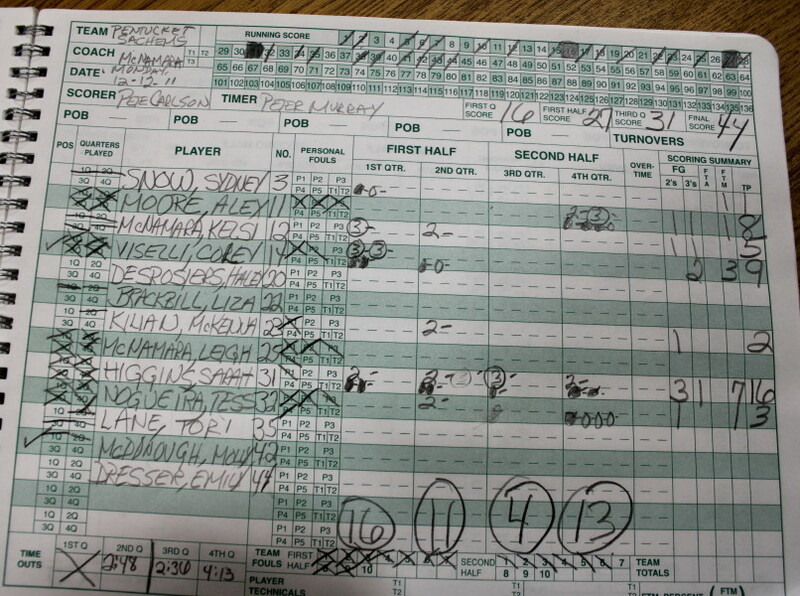 I’d have given it either to teammate Sarah Higgins and her 16 points or to Alex Moore for her 4th quarter heroics. Alex had the 4-point play and less than a minute before that had an old-fashioned 3-point play. Those seven points were huge in this low scoring game. Molly McDonough and Molly Rowe were given student/athlete scholarships afterwards thanks to Provident Bank. A good crowd of Sachem support was on hand. 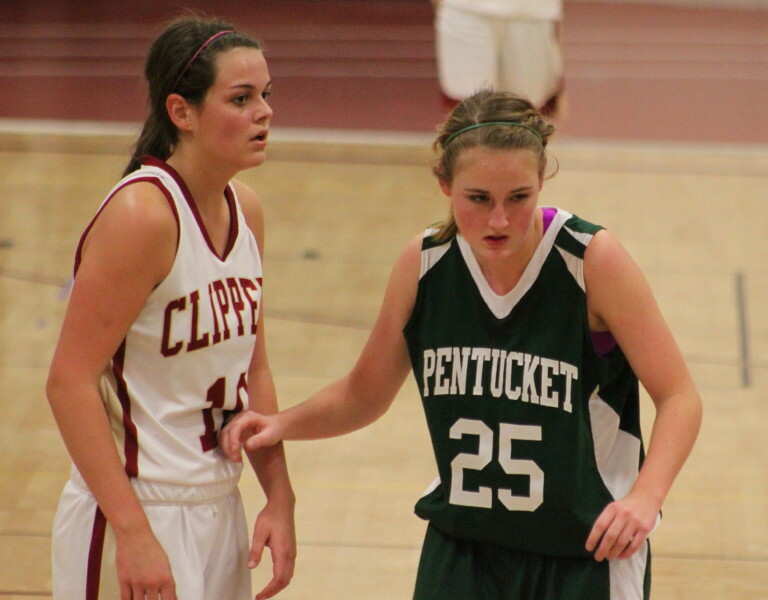 We saw the debut of a couple of Pentucket freshman – McKenna Kilian & Kelsi McNamara. 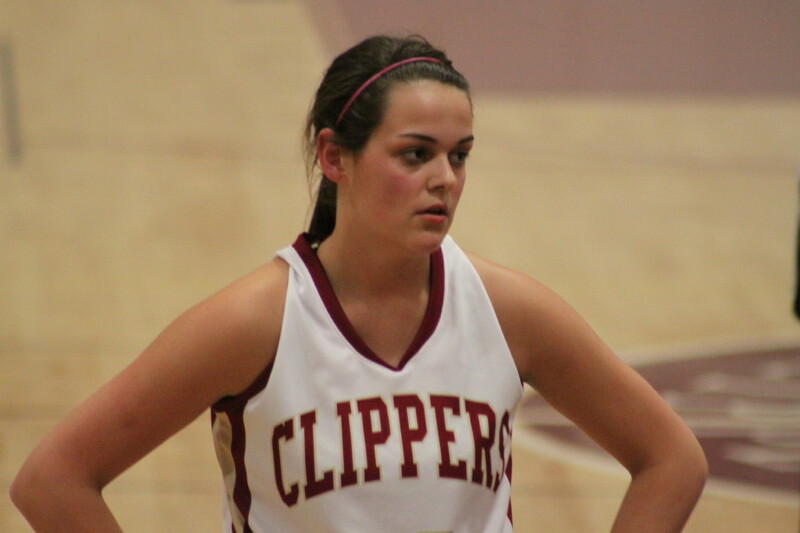 The Clippers will be able to count on points from seniors Beth Castantini (15) and Molly Rowe (11). Bettering last year’s 13-7 record could well depend on steady scoring from other players. Molly Rowe gets student-athlete scholarship from Coach Gregg Dollas. Tess Nogueira and Leigh McNamara both spent time defending Beth Castantini. Both players picked up their fourth foul in the final period. The quickness and all-out approach of junior Meri Adsit was impressive.